Hello again, friends! Today I have more Fashion + Style inspiration to brighten your afternoon, thanks to the impeccable style of Jackie, the ladyblogger over at The Cubicle Collections. 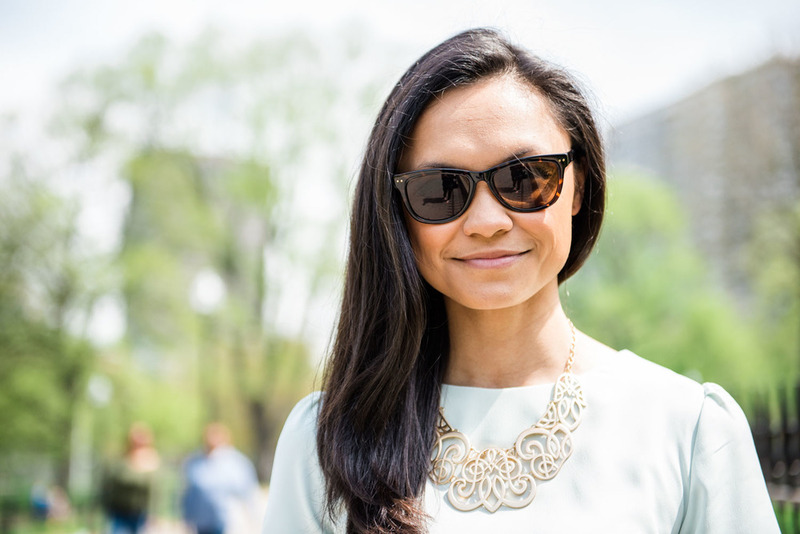 Jackie writes about fashion and lifestyle for the 9-5 working girl. She is such a wealth of knowledge with all kinds of tips, tricks and resources, and I'm so glad she writes for women in the corporate world in a down-to-earth way! This session with Jackie was just the best. I could say that about most of my photo sessions, but this woman is totally fun to be around and chat with, and she was so relaxed and ready to go with the flow of where the day took us! I like to think I'm as much of a go-getter as the next driven woman, but my favorite photo sessions are the ones where my clients and I are both relaxed and ready to try new things without rushing through the photoshoot process. 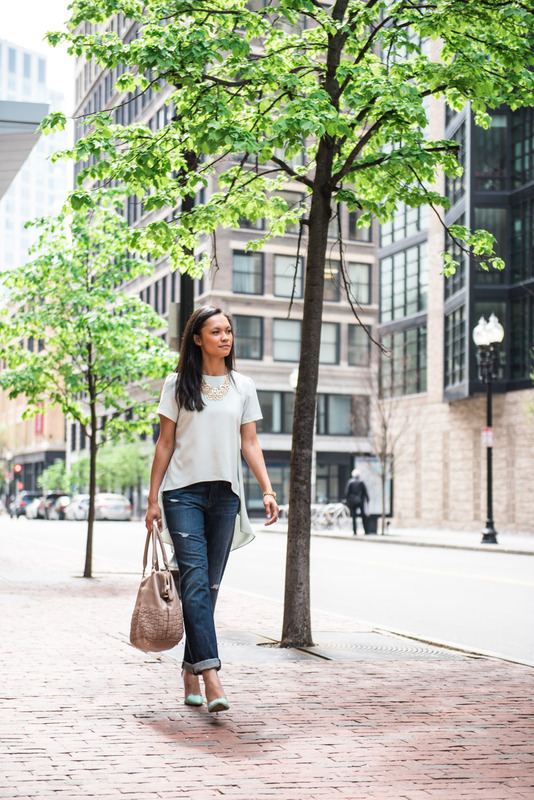 Jackie and I strolled the streets of Boston finding some of the prettiest and most interesting spots to help showcase the outfits she styled for her blog. We didn't have to work too hard since it was a BEAUTIFUL day and city felt so alive! In this post you'll see the Paramount Theater, Brattle Book Shop, and Boston Common. 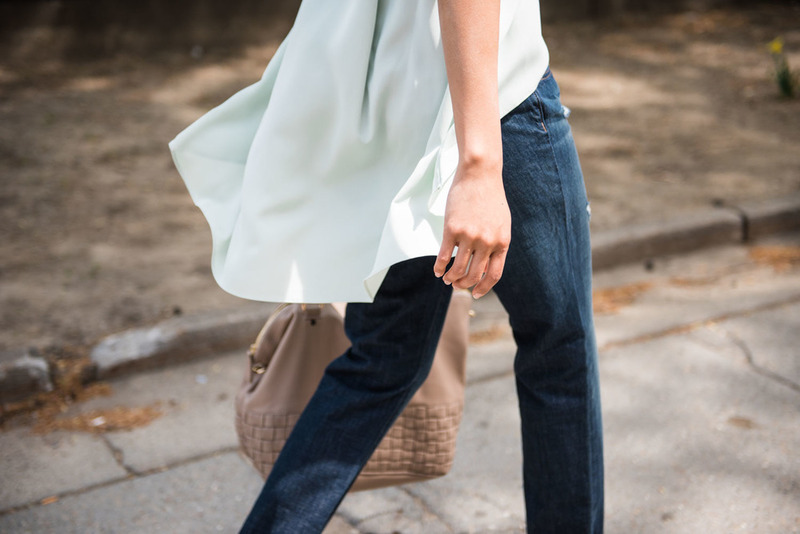 Jackie paired a high-low blouse with boyfriend jeans and matching heels, and I love the consistent pastel theme! Statement jewelry breaks up the block of color. 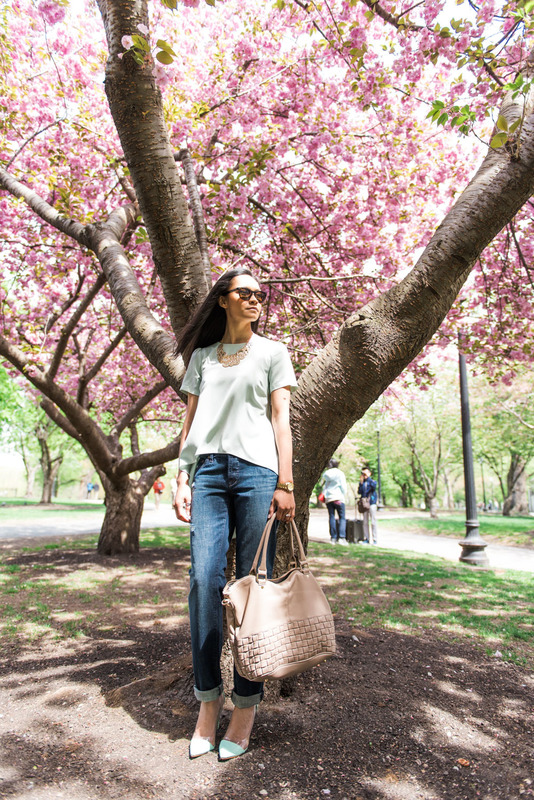 Of course you need a bag too, and Jackie loves this vegan leather satchel! Be sure to visit her blog to find links for where to get pieces of her outfit for yourself! Enjoy, and be inspired! What do you think of this ensemble Jackie styled for her session? Did it inspire you to try something new in your own outfits? Tell me in the comments! Also, visit me on Facebook and Instagram to see an exclusive outtake/cute moment photo this week! Looking for a new, fresh way to share your personal style with the world, fall in love with blogging all over again, and get a self-confidence boost for an added bonus? Get in touch for your own Fashion+Style session with yours truly!